Last month I joined the Daring Kitchen. It is a site for cooks to come together and try to cook the same challenge recipe, then report back on their blogs. They have two kinds of challenges, one for Bakers and one for Cooks. I signed up for both, since I love both of those adventures in the kitchen. I love the idea of having a goal to accomplish and being presented with things that I might not ever venture to cook, either through uncertainty or just not knowing or thinking of it. This is also a great way to challenge my nomad kitchen. I move around and rent places as I go. I don’t have my own kitchen, and I’m limited to what my rentals give me. The only kitchen tools I pack with me are my Mac chef’s knife, a sharp paring knife, a digital scale, a Flavour Shaker, and US measuring cups and spoons. So cooking recipes that are often designed for someone in control of their own kitchen can be quite fun. I do love the challenge though, and I’m excited about being a part of the Daring Kitchen now too. So, here is my first challenge! The July 2010 Daring Cooks’ Challenge was hosted by Margie of More Please and Natashya of Living in the Kitchen with Puppies. They chose to challenge Daring Cooks to make their own nut butter from scratch, and use the nut butter in a recipe. Their sources include Better with Nut Butter by Cooking Light Magazine, Asian Noodles by Nina Simonds, and Food Network online. They had four recipes to choose from which all used a nut butter. I ended up choosing the Asian Noodle Salad with Cashew Dressing recipe. Being in a “borrowed” kitchen I have to work with the tools I have. I don’t have a food processor in this rental. I was determined to make the nut butter though instead of resorting to buying it pre-made. I also don’t really have a clue about where I’d be able to buy cashew butter here anyway. So, no processor, but luckily this kitchen does have a sturdy immersion blender. It didn’t make the smoothest, creamiest cashew butter ever, but it got the job done. I put the nuts in a narrow container that just fits the blender, got the blender in, then wrapped a towel around the top to catch stray nut pieces firing all over the place. I took my time breaking up the nuts and stopping frequently to shake up the container until everything was pretty finely ground. Once things started to clump and stick a bit, I decided I should move to a slightly larger container. At this point I could take the towel away and see what I was doing better. I just kept blending until the cashews started to ooze out of the blender as a paste. I mixed it up to make sure the drier stuff got mixed in and in a few minutes I had a passable rendition of cashew butter. I imagine I could have gone for a few more minutes to get it creamier, but I figured this was good enough for my needs. Woot! Now that the hard part was over, I just needed to cook up my meal. The dressing is very simple to make. Just chop up a few ingredients, dump everything in a blender (or container for immersion blender in my case) and zip zam bang, you have some tasty deliciousness. This is what the immersion blender was made for. The salad itself is again, very simple. Chopped up my veggies, cooked some noodles up, and fried the tofu. I ended up using some 2-minute asian noodles which I have around for soups. They worked OK, but they are definitely tangly and tend to stick a lot once they sit, so I’d probably try different noodles next time. Still turned out just fine though. For the tofu, I fried them in some oil until they were at least partially golden brown. I have no patience for flipping them over to make sure every side gets fried evenly. I tend to be satisfied if there seems to be a general golden look going on. I was particularly not patient for this dish because the tofu kept sticking to the pan and ticking me off. A non-stick pan would be better for frying tofu, but I don’t have one here. If you are patient and want a better looking presentation, I guess you should take the time to be more thorough. Once the main components – dressing, noodles, vegetables, tofu (or meat) – are ready, you pretty much just need to mix it together and plate it. Well the point of this exercise and the main flavor of this dish is in the dressing, and damn is it good. Really good. I can think of a lot of other dishes I’d like to use this in, so it is definitely a keeper. This was a quick and simple meal to throw together. I cooked it on a hot day and so originally was going to serve it chilled, but by the time I got to cooking we were starving so we didn’t want to wait, so I served it up warm, like the recipe. I’d like to try it again with different noodles and chilled for sure. Make cashew butter by grinding the cashews in food processor for about 2 minutes until smooth, or spend a bit more time and effort using an immersion blender. (*Or start with ½ cup (120 ml) prepared cashew butter.) You can make this ahead of time and set aside until you are ready to cook. Prepare cashew dressing: Combine ginger, garlic, cashew butter, soy sauce, sugar, vinegar, sesame oil, and water in food processor or blender. Process/blend until smooth. Be sure to process long enough to puree the ginger and garlic. The dressing should be pourable, about the same thickness as cream. Adjust consistency – thinner or thicker — to your liking by adding more water or cashew butter. Taste and add your favorite hot sauce if desired (I’m a fan of Sriracha). (If the cashew butter was unsalted, you may want to add salt to taste.) 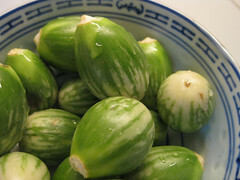 Makes about 1 ½ cups (360 ml) dressing. Store any leftover dressing in the refrigerator. Prepare noodles according to package instructions. 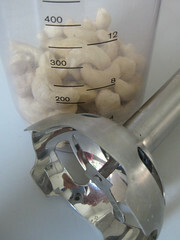 Rinse and drain noodles. Set aside. Heat oil in large pan (preferably non-stick) over medium heat. Add tofu to the pan and sauté, turning them to get an even golden color. Remove when golden. Slice basil into thin ribbons. Combine noodles, vegetables, pepper, onions, and basil in a large bowl. Add about ½ cup (120 ml) cashew dressing; toss gently to coat. Add more cashew dressing as desired, using as much or as little as you’d like. 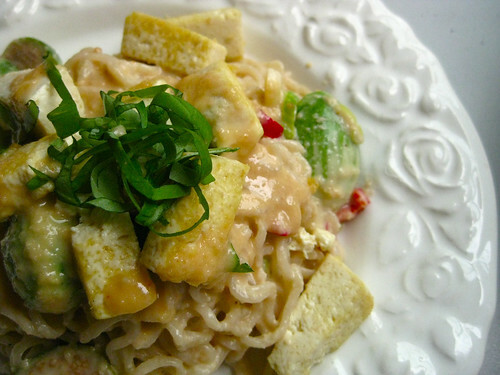 Scatter tofu on top. Sprinkle with chopped cashews and/or lime if desired.